In 2010, Lucy Jones of Cammeray lost her beautiful daughter, Sienna, to one of the most aggressive, unrelenting, deadliest childhood cancers, called neuroblastoma. Today, Lucy is the CEO of Neuroblastoma Australia, and focuses all her efforts on fundraising for vital research at the Children’s Cancer Institute Australia and Cancer Council NSW. My little girl was normal in every way. She was a fun-loving toddler and had a real zest for life. At nine months, doctors found a tumour on Sienna’s abdomen. It wasn’t a benign, harmless tumour. It was neuroblastoma, and Sienna had the worst possible diagnosis. What followed was seven months of gruelling treatment at Sydney Children’s Hospital Randwick. Our baby endured seven rounds of high dose chemotherapy, two operations, a stem cell transplant, four weeks of radiotherapy and about 40 general anaesthetics. We were told several times that Sienna could also face secondary cancers due to the treatment or, in fact, die from an infection due to her immune system being shot to pieces. Sienna did amazingly well – she got through every treatment and at the end of those seven months she was in remission. We were so hopeful that this was the end of it. 11 months later, in September 2009, all hopes were shattered as a new tumour was found. We were told if Sienna relapsed she would have a 0-1 per cent chance of survival. Our world fell apart. How were we going to save our daughter from this awful disease? I contacted professors all over the world and generally the outlook was one of gloom, until we found an amazing professor at Royal Marsden in the UK who got Sienna on a clinical trial for a new drug. We had a plan and we had hope, but while we were waiting for the trial to commence six new tumours appeared throughout her body and the cancer spread to her bones. We started chemotherapy to try to hold the disease at bay. We saw five of the tumours responding to treatment and the sixth tumour had also seemed to have slowed down… But just before the next cycle of chemotherapy, the sixth tumour started to grow out of control. What happened next is beyond words. We watched our beautiful girl helplessly while this disease ravaged her. Sienna lost her battle on 3 February 2010 and her baby brother was born just five days later. I lay in bed next to Sienna. My little boy was kicking inside me as my little girl was being taken away from me. It was like a cross over of two different worlds –worlds so far apart and disconnected from one another, that it almost felt unreal. But it was very real and Sienna was gone. I woke up every morning for the first year hoping that what had happened was really a nightmare – I then had that terrible feeling and realisation that Sienna, my precious little girl was not there and would not be coming home. I started fundraising for Children’s Cancer Institute Australia (CCIA) when Sienna was first diagnosed. I chose to fundraise for neuroblastoma research because I knew back then – and I still believe today – that neuroblastoma, and all childhood cancers for that matter, can be cured. But not without medical research. Then in 2010 I formed, along with another family battling the traumatic and life-threatening disease, a registered charity called Neuroblastoma Australia. Neuroblastoma Australia’s mission is that, via vital research, all children with all types of neuroblastoma can survive and lead long and healthy lives, free from the side effects of their treatment. 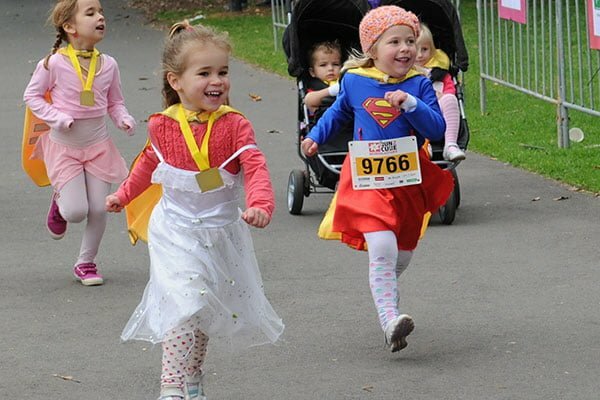 Kids can dress up as Super Heroes at Run2Cure! 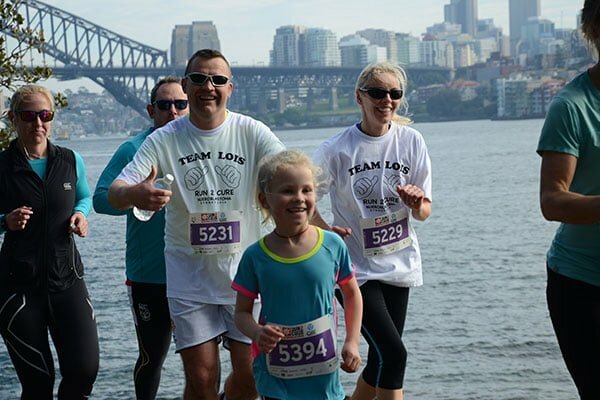 One of Neuroblastoma Australia’s biggest fundraising events is the Annual Run2Cure and it will be taking place again this year Sunday 2 June in the picturesque surrounds of the Domain and Royal Botanic Gardens, Sydney. The aim of Run2Cure is to raise important funds for vital research at the Children’s Cancer Institute Australia and Cancer Council NSW into, neuroblastoma – the number one cause of cancer deaths in children under 5 years of age. More than just a fun run for all ages and abilities, Run2Cure includes a huge array of family entertainment. Kids under five love the chance to dress up as their favourite superheroes to take part in the 1km Little Heroes walk. Parents can push their babies in prams in this event. There are also timed 3km, 5km and 10km distances, and this year the brand new 1km Junior Dash for kids aged six to nine will join the line-up of events. Participants are encouraged to register for the event as individuals, families or groups and help fundraise for the event – with donations directly supporting much-needed research into this greatly underfunded form of cancer. A fun run in spectacular surrounds! The average age of children being diagnosed with neuroblastoma is just 2 years of age and children with the most aggressive form of the disease only have a 50% chance of beating the disease. I hope my story will help make a difference and people will get behind Run2Cure and support our fundraising efforts for research into neuroblastoma. I thank you in advance for your assistance and support. Neuroblastoma Australia’s 7th annual Run2Cure will take place on Sunday 2 June in the picturesque surrounds of the Domain and Royal Botanic Gardens. So gather your friends and family, and enjoy fun day out!